This page contains information about surgery for De Quervain’s disease. You should contact your GP or health professional if you have any questions about the procedure. During the operation a small incision is made at the base of the thumb. This allows the surgeon to access and cut open the roof of the tunnel causing the pain. 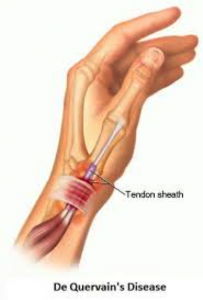 Following surgery the tendons should be able to glide freely through the tunnel. Exercising regularly should help you resume normal activities as quickly as possible. Always consult your healthcare professional or GP for advice before you start exercising.